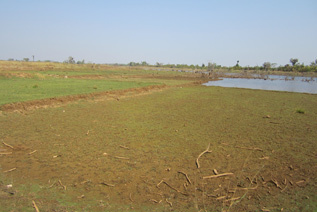 This Short Update describes events occurring in Hti Lon Township, Hpa-an District in March 2014, including land confiscation committed by the Burma/Myanmar government and wealthy individuals, destruction of villagers land due to flooding caused by a dam, as well as the strategies of villagers to claim back their land, and obtain compensation for the land that they have lost. In Naung Ka Myaing village, fields belonging to 39 villagers were confiscated and flooded by the Yay Boat Dam (also called the Hti Lon Dam), resulting in the destruction of over 3,000 acres of land. A further 44 villagers had their land confiscated and marked as ‘forest land’. The villagers filed an official case with the Burma/Myanmar government, in an attempt to receive compensation, and have submitted a list of landowners and the amount of land they lost, as well as videos portraying the land. Burma News International (bnionline.net) conducted a video news report on the case. A link to the video, as well as a description of its contents, can be found below, following the tables. The following Short Update was received by KHRG in April 2014. It was written by a community member in Hpa-an District who has been trained by KHRG to monitor human rights conditions. It is presented below translated exactly as originally written, save for minor edits for clarity and security. This report was received along with other information from Hpa-an District, including six other situation updates, 1,080 photographs and two video clips. I want to report about the suffering of the villagers of Noh Ka Mler village. The village is called Naung Ka Myaing village in Burmese. The villagers are suffering the same things as the villagers from Maw Ko Der village, Hti Lon village, the kaw la [Muslims] and the Mon. In the list that was submitted to me by the villagers of Naung Ka Myaing village, there are 40 fields that were flooded [due to the Yay Boat Dam]. They submitted the amount of land and the names of the villagers whose land was confiscated. They also submitted the acres of land that were confiscated by the government and rich people, and the names of 58 land owners whose land was confiscated. The villagers are also trying their best to get compensation for their land that was affected by flooding, and the land that was confiscated by other people. There are 3,000 acres of land that were flooded. They also gave videos that show the land that was confiscated (while traditional music plays in the background), and the list of land owners, in their own hand writing. The government also threatened the villagers. Burma News International (bnionline.net) conducted a video news report on the case, which can be viewed below or at http://burmese.bnionline.net/index.php/videos.html?task=videodirectlink&id=200 (Burmese language). In the video, local people who live between Hti Lon Township and Hpa-an Township discuss the land that they have lost due to the construction of the Hti Lon Dam, and how they reported this to Nan Say Hwah, a member of Parliament from Hpa-an Township. Over 100 people from Hlaingbwe Township, Karen State, had over 3,000 acres of their land confiscated due to the construction of the dam, and the villagers have encountered various difficulties because of this. The villagers do not have land to live and work on, so they must do odd jobs in order to survive. In addition, a number of their children have gone to work in Thailand, as there is no work available locally. 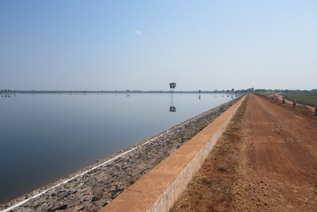 The local Agriculture and Irrigation Ministry (#6) began construction on the Hti Lon Dam in 2006, and finished in 2010. The villagers have not yet received any compensation for the land they have lost. Villagers from Naung Ka Myaing village in Hpa-an Township, and Hti Lon village & Yay Pu village in Hlaing Bwe Township, in particular have suffered the consequences of the dam project. The villagers were not informed and consulted about the project. U Zaw Htike, Chairman of the 88 Generation Students in Hpa-an, arranged for the villagers to meet with Nan Say Hwah. Nan Say Hwah stated that she did not have the right to tell the Chief Minister of State to provide compensation to the villagers who lost their land, but she will report about the case to the Minister, as well as to the chairman of the Farmland Investigation Commission. Kaw La Thu, “thu” meaning black, is a term used to refer to Muslim people by Karen people in Burma. Muslim people do not typically self-identify with this term. The Mon people are believed to be some of the oldest inhabitants of Southeast Asia. Most live in the central Myanmar government demarcated areas of Mon State, located in the south of Burma and bordering Kayin State, Bago Region (formerly Pegu Division) and Tanintharyi Region (formerly Tenasserim Division). These areas overlap to an extent with KHRG’s research areas, which follow a locally defined system of demarcation. In the original report, the researcher indicated there were 58 landowners whose land was confiscated. Upon reviewing the lists provided, there were 39 landowners who lost land due to flooding, and 44 whose land was confiscated and marked as ‘forest land’. The video describes ‘over 100’ villagers losing their land due to flooding caused by the dam. KHRG only received information pertaining to 39 villagers who lost their land specifically due to flooding.